With Father’s Day just a few days away, I wanted to do something special for my dad, since this is the first Father’s Day we would have spent together in six years. Unfortunately he will be leaving back to Colorado so he can spend it with his grandsons (we call our doggies Pork Chop and Chubby his grandchildren. We’re still not sure if he likes it or not). So my grand plans of a Father’s Day BBQ went out the window. I’m not bitter because we got to spend some valuable quality time together. And we bonded a little over lots of coffee and pan dulce. So as a last-hurrah, we took the weekend before Father’s Day to show him a great time; from breakfast at Grand Central Market where he told us of a time he brought his ’65 Chevy into Downtown back in the 70’s when the Market still had sawdust scattered on the floor and actually served as a produce market vs. a gourmet food court, to El Mercado in East LA where he told us over dinner that he got my mom to ride on his motorcycle once or twice. 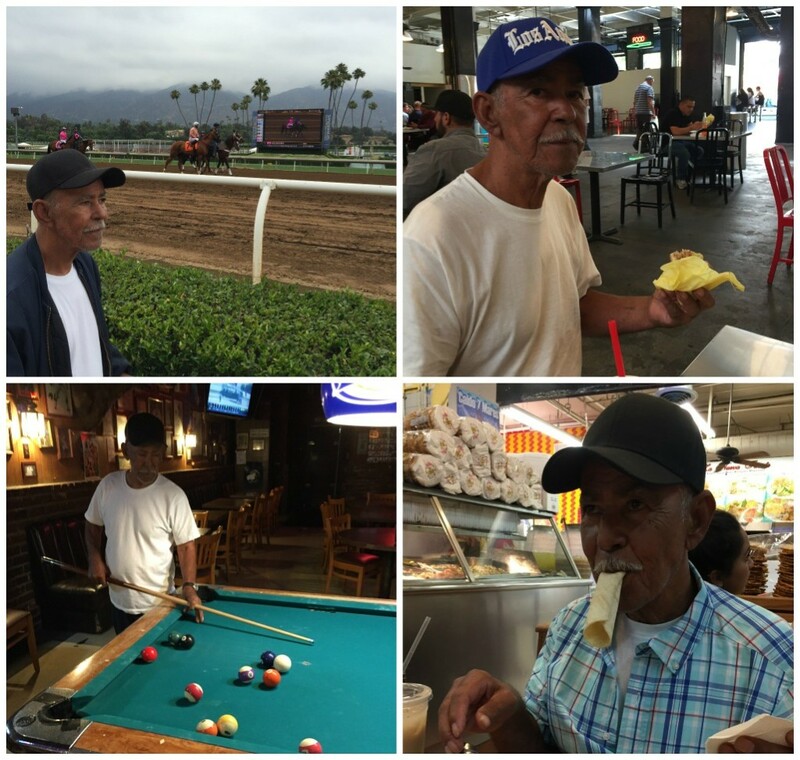 We even visited the race track and our neighborhood watering hole where he dropped his walking cane for a pool cue stick to reclaim his place as King Pool Shark. The places we took him to evoked memories and helped to create new ones. My dad is a simple guy who eats pan dulce with his coffee almost every morning and enjoys his baseball games on TV. So for his big weekend sendoff, I thought it might be nice to grill some meat so he can douse it with bring-tears-to-your-eyes burning hot salsa and enjoy a cold brew. My sides? Potatoes of course, in this case, potato salad. I want to tell you about this potato salad but what is there to say about potato salad that hasn’t already been said? It’s the perfect side dish any time of year because you can serve it warm or cold, and you can mix an endless combination of raw or cooked veggies, fruits, proteins, nuts and berries. So along with omelets and pizza, potato salad has the potential to truly be a super food, nay, super dish. For this recipe I used Idaho Potatoes’ Baby Dutch Yellow Potatoes. 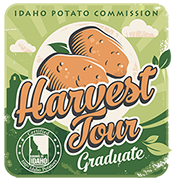 There are more than 27 varieties of Idaho Potatoes to choose from so you have some flexibility. 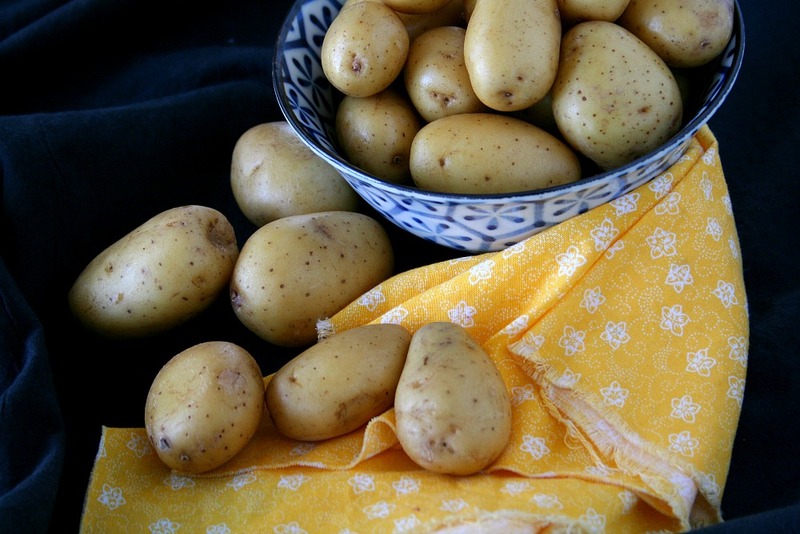 Baby Dutch Yellow Potatoes are roundish with pale yellow-white skins. Adding to its’ super-dish status, these little potatoes can be cooked almost any way you can think of: roasted, grilled, boiled, fried and even nuked in the microwave. This potato has light, subtle flavors with a lusciously creamy texture. My dad isn’t too fussy…except when he is. So mayonnaise-based potato salad is out. I adore mustard based potato salads but that might be too “new” for him. I was thinking about his favorite condiments, and how I can work that into his salad. That’s when I arrived at red chimichurri. It has some of the same hallmarks of a traditional green chimichurri, like spicy chili flakes and biting raw garlic with fresh herbs, but with the addition of smoky red paprika. This recipe makes more than you’ll need for your salad, but you can use the remaining sauce to dip crusty bread or to marinate pretty much anything you’re going to grill. Or package it as a gift for your dad to use later. 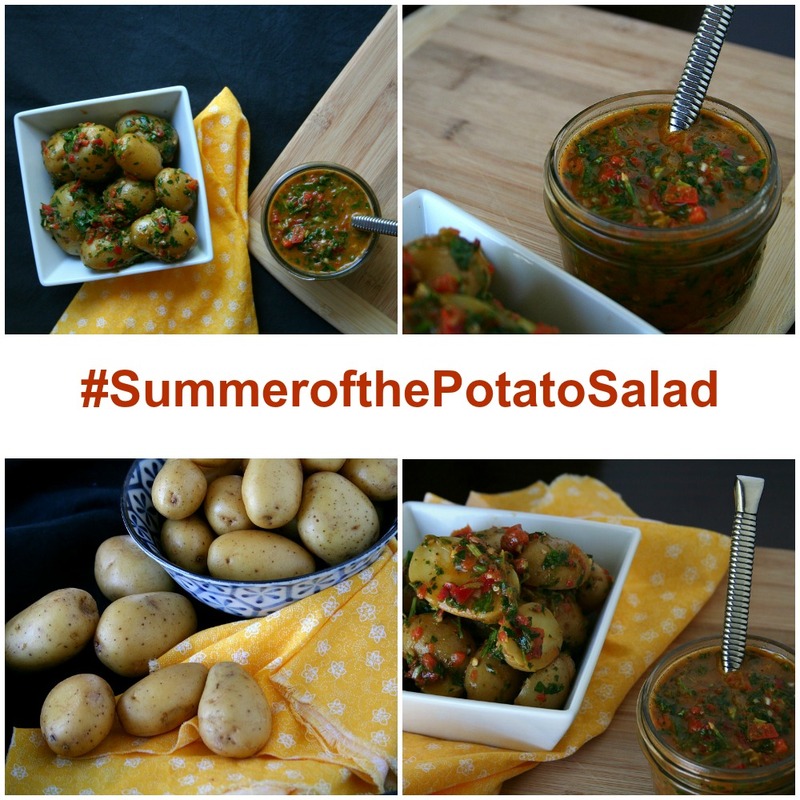 For more recipes and tater-inspiration, visit The Idaho Potato Commission site and keep up with Idaho Potatoes on Facebook, Twitter and Instagram. To all the fathers out there, have a very HAPPY FATHER’S DAY! 1. Place the potatoes in a large pot and cover with cold water. Place over high heat and bring to a boil. They are small so they should be done in about 10 minutes. (How to test for doneness: insert a steak knife in the middle of a potato. If it slides off easily they are done.) Careful not to overcook them or they will turn into mashed potatoes. 2. Strain the potatoes and allow the potatoes to cool slightly. 3. In a food processor, add all of the remaining ingredients (except the oil) in a food processor. Pulse until the ingredients are roughly chopped. 4. Slowly drizzle in the oil while pulsing the food processor. I prefer the chimichurri to be a little thick and chunky, but that is a personal preference. 5. Halve or quarter the potatoes into more manageable bites. 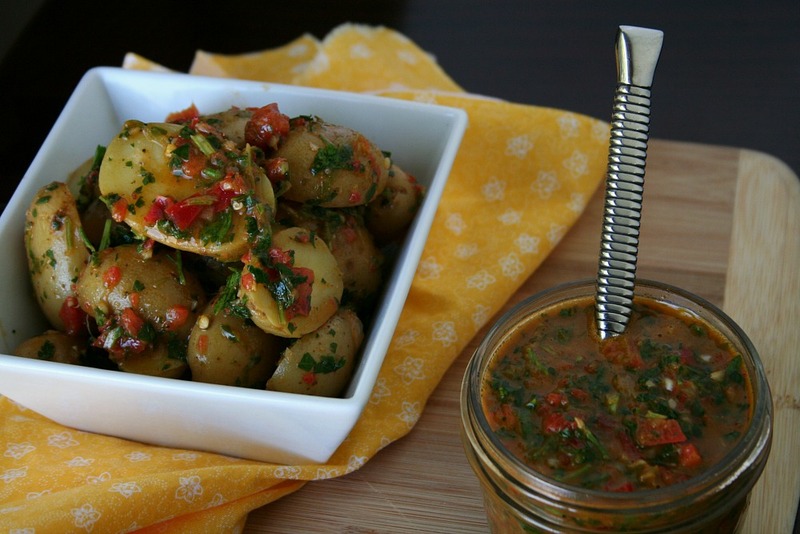 In a large bowl, gently toss the potatoes with a quarter of the chunky chimichurri, to begin, adding more as needed. 6. 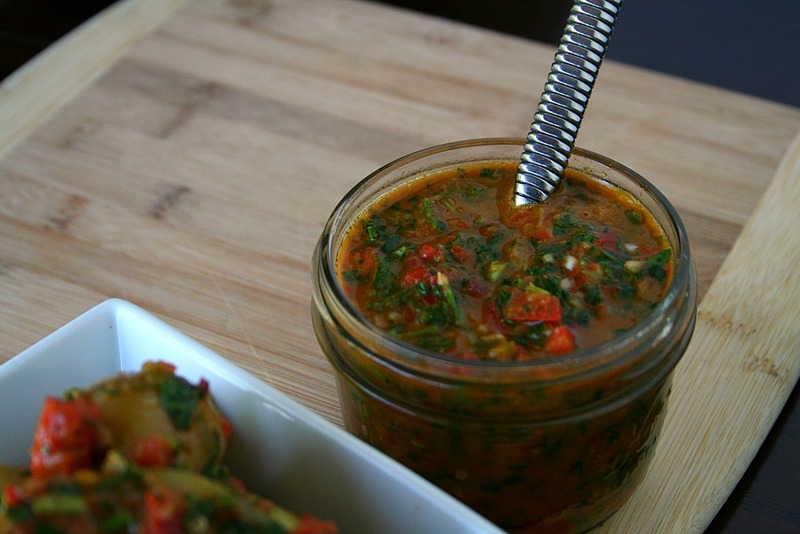 The remaining red chimichurri can be used to marinate your veggies and or your steak for the meal. If you choose to store the remaining chimichurri, place a seal tight jar and know that it will keep in your refrigerator for about a week.